I am deeply saddened by the loss of my dear friend and mentor Bernard Lietaer, who died Monday morning at his home in Hoherhagen, Germany with loved ones. I had the great honor of getting to know Bernard in recent years as he served as President of the Bprotocol Foundation and its Chief Monetary Officer. Bernard was a financial justice warrior; a fierce advocate, sharp businessman and revered educator who dedicated his extraordinary career to exploring global monetary systems, uncovering truths about their effect on civilization and shaping their evolution through rigorous research, eloquent writing and heartfelt lectures around the world. I first met Bernard when he came to Israel to give a talk on community currencies at the University of Tel Aviv. One of my co-founders was presenting our own work on local currencies, and I ended up sitting next to Bernard and translating her entire lecture for him from Hebrew to English, in real-time. It was intimidating and also exhilarating — to directly share our findings and ideas with a hero who had inspired our work to begin with, via You Tube videos we discovered while researching Bitcoin in 2011. We then reconnected several years later after he read the Bancor Protocol whitepaper and believed it to be the breakthrough he had been searching for in his decades of work on complementary currencies. His ideas about money were often ahead of their time. As a graduate student, he developed the first in-depth research on “floating exchange rates” a year before President Nixon took the United States off the gold standard and initiated a worldwide shift to floating exchange. Later, as a central banker, he designed the European Currency Unit, the precursor — and what many have said was a superior approach — to the Euro we have today. As the Great Recession wreaked havoc in 2012, and austerity measures constricted the flow of national currencies in debt-saddled nations like Greece, Bernard urged Greece’s cities and towns to adapt and create their own pararrel currency-system. 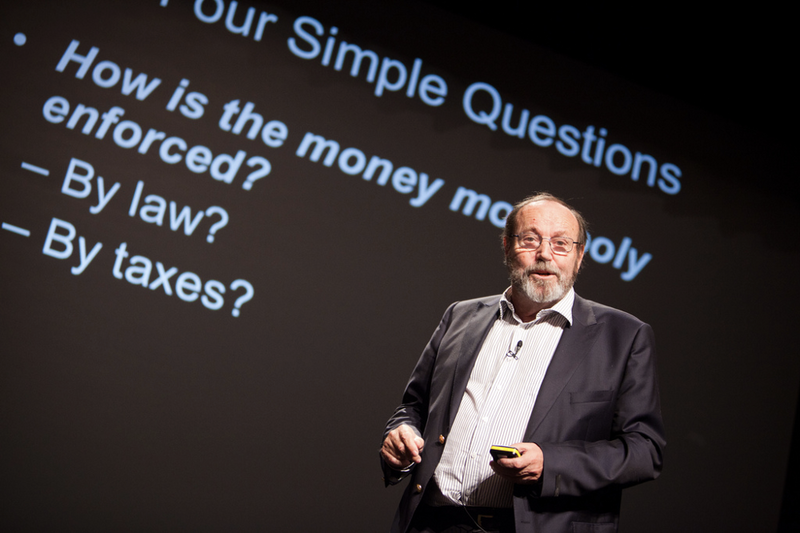 And long before blockchain technology emerged to offer a new set of tools for currency development, Bernard advocated for an alternative, multidisciplinary view of money which drew on findings from history, psychology and ecology to expose untruths about the global monetary system, inspiring discourse, debate and global action by entrepreneurs and activists to redesign money from the ground up. One of my favorite talks by Bernard in which he outlines his vision for the future of money and the planet. Bernard ventured beyond the corporate boardrooms and government corridors to advance new ideas about currency and initiatives that shared his vision for systemic reimagining. “Below the radar beams of many official monetary experts, fundamental change in our money systems is in fact already well under way, irresistibly driven by the social and technological forces of the Information Age,” he wrote in his 2010 book “The-future-of-money”. He sensed that the evolution of money would have to bubble from the ground up, rather than be prescribed from the top down — and his optimism in this eventuality strengthened with the advent of accessible connective technologies such as cellular networks and the Internet. As a student at MIT in the late 1960s, Bernard gained notoriety for his postgraduate thesis on how to optimize currency management for multinational corporations. His research was among the first to shed light on “floating exchange rates”, which change a currency’s value based on supply and demand in the market. The year after the publication of his thesis, President Nixon took the United States off the gold standard, initiating a global shift to floating exchange rates. Bernard’s research became extremely valuable, and a major U.S. bank negotiated the exclusive rights to his methodology. He departed the Central Bank of Belgium in 1987 to launch Gaiacorp, one of the first large-scale offshore currency trading funds. The company quickly grew into one of the largest and most successful currency management firms in the world, leading BusinessWeek to name Bernard “the world’s top trader” in 1990. In the mid-1990s, Bernard left the currency trading firm he founded and embarked on a decades-long mission to teach and consult worldwide on the merits and shortcomings of different monetary systems in an effort to help society make more conscious choices about the financial architecture that governs our collective collaboration. In his last book, “Rethinking Money”, published in 2013, Bernard argues that monetary systems function similar to natural ecosystems in that both require a balance between efficiency and resilience in order to be sustainable. For instance, an ecosystem that has one type of animal which survives off one type of food is an efficient ecosystem, but if the food becomes unavailable due to blight or illness, most likely the animal will die and the ecosystem will collapse. Science shows us that natural ecosystems with different types of life and high connectivity between them have a greater capacity to handle changes in their environment (i.e., more resiliency). This is also the case for economies, Bernard argued, and with too little diversity or too little connectivity (and vice versa), both natural and monetary systems will suffer breakdowns. Bernard believed that today’s global monetary system was too efficient and therefore too brittle, as evidenced by its repeated instability — including 145 banking crises and 208 monetary crashes between 1970 and 2010 alone. The excessive efficiency is caused by the fact that only one type of money, national currency, flows within a country, created by bank debt and interconnected only at the global level via international exchange rates. While a single type of currency increases efficiency by optimizing price formation and exchange within national markets, there are no other options to sustain trade when a downturn hits and the flow of national currencies slows. “Monetary sustainability requires a diversity of currency systems, so that multiple and more diverse agents and channels of monetary links and exchanges can emerge,” he said. Bernard compared today’s national economies to ecosystems where only one type of plant is tolerated and artificially maintained, and any manifestation of diversity is eradicated as an inappropriate “competitor” because it would reduce the efficiency of the whole. Following his years in the currency trading world, Bernard emerged as an ardent supporter of complementary or “cooperative” currencies that supplement and complement the national currency. He battled beliefs that complementary currencies were defective and that the coexistence of different forms of money hindered the efficient functioning of exchange and price formation. He researched and promoted numerous examples of complementary currencies across the globe — from the Brixton Pound in England, to Torekes in Belgium, the C3 in Brazil and the WIR in Switzerland. “A quiet revolution is happening that has, for the most part, gone under-reported. The number of contemporary cooperative currencies operating in the Western world has grown exponentially from two in 1984 to more than 4,000 mature systems today,” he wrote in 2013.